Screen blinding is described as an evil byproduct of the sifting process in the milling industry. Dry screening is the common course of production in the milling industry. Separator motion of sifting has inherent notorious drawbacks. And screen deblinding balls, or sieve screen cleaning balls are the milling save of the day! Sieve cleaning balls or Polyballs™ are the second most utilized screen cleaning method and probably the most effective. Often 1 3/8 inch in diameter, the balls are supported in the second chamber of mesh or metal screen about two inches below the classifying mesh screen. The balls are powerfully ‘thrown’ up against the bottom of the screen causing the balls to bounce erratically and loosen the trapped particles that have built up on the wires and have prevented further material from successfully passing through the screen openings. For finer powder, the screen openings are smaller in which case the screen deblinding balls or Polyballs™ tend to be a smaller diameter and the second coarser mesh screen slightly closer to the product being sifted. Steel Core Polyballs™ are efficient in the process as they provide easy collecting. As they jump to a magnetic bar spacer, the balls can be activated and deactivated according to customized process settings. 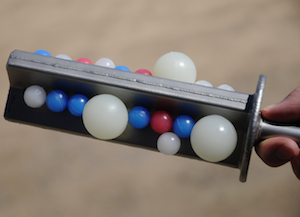 Polyballs with a steel core also bounce with a greater velocity because of their increased weight. The steel core Polyballs™ impart more energy to each impact when compared to a non-steel core Polyball™. The ideal mesh is course rather than fine so as to withstand the high impact energy the results from the vigorous vibration.